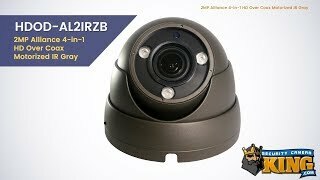 The latest Alliance series 2MP (1080p) weatherproof dome camera can work with four different technologies! That’s right . . . you can use this camera with HD-TVI, HD-CVI, AHD and Analog!! 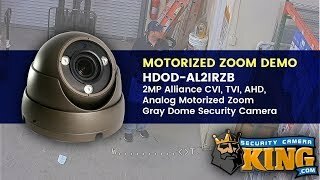 This camera has a gray housing and thanks to some great features, you can use this in many different situations for both commercial and residential needs. Because all of these technologies work by transmitting the signal over your existing coaxial cable (as long as it’s not too old!) delivering beautiful, high definition 1080p video! There’s also no need to go running additional cables to supply power since these conveniently use a standard 12v DC power supply. Pair these with one of our Tribrid or Quad technology DVRs (or even our Pentabrids) and you‘ll have a security surveillance system that you won’t need a new mortgage for! If you’re looking for a camera with lots of convenience features, then you’ll love the 2.8-12mm motorized zoom lens that makes climbing a ladder to change your view a thing of the past. Remember that this is a motorized zoom and will only change the view straight ahead. If you need to be able to change your view up or down or side to side, you should look into some of our PTZ Cameras for even more capable cameras that have even more capabilities! 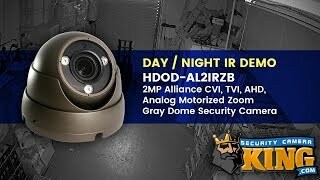 To round it out, you even have the ability to see in low-light and total darkness with the built in IR (infrared) that allows you to see as far as 98 feet away. We know you’ll want to keep this for a while so we include a 1 year warranty, FREE US based tech support and free remote monitoring software! I am very happy for the new addition of the format dip switch dongle. This makes it so you can have the correct format BEFORE you bury the cables behind the camera. This is on the Grey model but not on the white model for some reason.